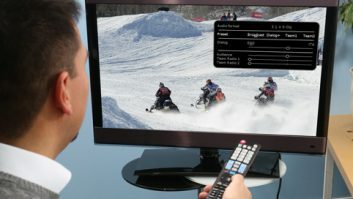 Wohler Technologies will showcase its MPEG Series DVB-ASI and IPTV monitors at the NAB Show. Wohler Technologies will showcase its MPEG Series DVB-ASI and IPTV monitors at the NAB Show. The MPEG Series enables a single operator to monitor all video streams, even those for delivery via web portals and mobile services, from a single system and interface. This consolidation of MPEG-2 and MPEG-4/H.264 streams into the mainstream workflow aims to reduce the cost and complexity of handling the various streams processed and distributed by facilities. Wohler MPEG monitors decode and provide at-a-glance monitoring of programme content from MPEG-2/4 ASI and Ethernet IP streams, as well as SD/HD/3G-SDI inputs. The MPEG video monitors identify, decode and display both MPEG-2 and MPEG-4 signals (input via BNC or Ethernet) in high resolution for each selected stream. Monitoring capabilities include Dolby Digital and Digital+ decoding, as well as the capacity to decode as many as 12 audio groups. In-picture level metering of up to 16 audio channels is provided for both average and PPM (peak) levels with selectable meter scales. Throughout NAB, Wohler will feature the MPEG-4290, a 4-RU system with two 9-inch screens; the MPEG-3270, a 3-RU system with two 7-inch screens; and the 2-RU MPEG-2443 with four individual 4.3-inch screens.